Hearing the word “elixir” may sound as if you are about to get mesmerised by something extraordinary. And you are not far away from the truth. For all developers familiar with Elixir as a programming language, it is a unicorn that is just too good to be true. What makes it so special though? You are about to find out now. But before that, let’s have a short history lesson about it. Elixir is a modern functional language built on top of the battle proven Erlang, a language developed by Ericsson in the long forgotten 1986. Though, 7 years ago Elixir appeared as its worthy heir bringing a new perspective in the modern software development. The language is part of the so called functional programming languages, which are characterised with increased readability and maintainability, which means that applications built in functional languages would allow for easier maintenance and at the same time provide high flexibility and scalability. 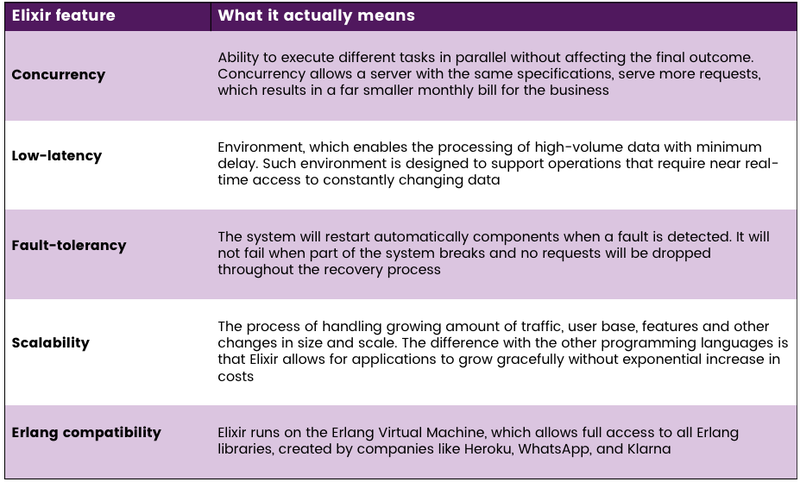 Due to the advantages that Elixir has over the imperative programming languages, it is very suitable for platforms with intensive traffic, highly concurrent connections and high availability requirements (minimum down time). Meaning that industries such as financial trading, forex exchange, gaming, digital marketing, and digital health may find great value in building their solutions on Elixir. Some of the most popular platforms already gave it a try — Pinterest, Moz, Discord, what are you still waiting for? If all you need is a reliable development partner, we are just a click away. Check out one of our recent Elixir projects here.